Alton College Social Media interschool challenge – Eggar’s won! While we recognise the needs of our most academically able students, we also recognise that all students at Eggar’s School have the potential to excel in some curriculum areas. In order to provide opportunities for the full range of their abilities and talents we challenge all our students to take part in additional activities through The Eggar’s Experience that extends and enriches their learning, promotes high attainment and good progress and equips them with a broad range of life skills. 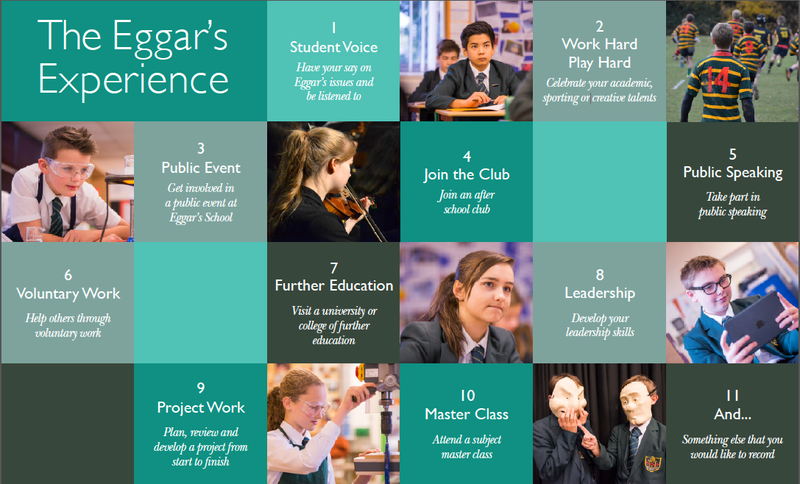 The Eggar’s Experience encourages all our students to become involved in at least ten key activities during their five years at Eggar’s School. These activities are designed to equip them with a range of key life skills in order to become more rounded and skilled individuals and therefore better equipped for further education and employment. Eggar’s students are expected to keep a digital record of the key challenges they are involved in. This record of achievement is regularly reviewed. Eggar’s School continues to strive to further the provision for all our students to provide them with the skills for further education and employment. One of our latest initiatives is an application for the NACE Challenge Award. This prestigious award is given by the National Association for Able Children in Education (NACE), a leading national education organisation. The association exists to help the daily work of teachers providing for students with high abilities whilst enabling all to flourish.